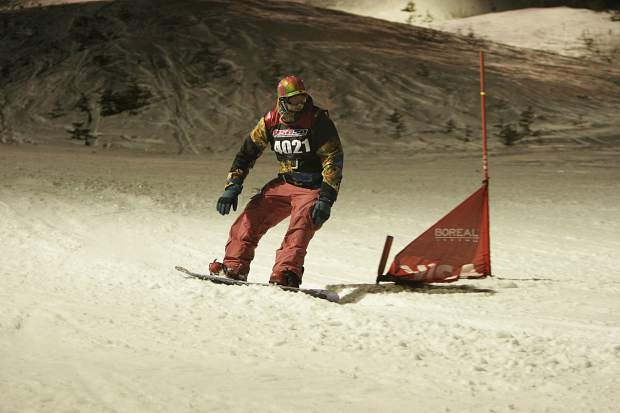 Dave White Jr. rides to first place in the men’s 23- 29-year-old division on Wednesday, Jan. 3, at Boreal Mountain Resort. Dave White Jr. shouldn’t be where he is today. At least that was the conclusion doctors made 27 years ago, when he was born. White came into the world with a massive brain hemorrhage, and at that time his parents were told their son would never live a normal life. “Massive bleeding in the cerebellum and the doctors told my parents that I’d never be able to walk, never be able to run, never be able to act like any other kid,” said White. In some ways those doctors were right, White hasn’t had a normal life. Every day begins with him spending the morning stretching his body out, relieving the tension built up from the past night’s sleep. But after that, White could be doing anything from snowboarding via helicopter in New Zealand, to giving motivational speeches in front of hundreds of people, or even writing his own children’s novel. White grew up splitting time between his family’s residence in Davis, and their second home in Truckee, which his father and grandfather built during the 1970s. And though his birth was traumatic, it didn’t stop his parents from pushing the toddler to be just like anyone else. As a 1 year old, they put him in skis and pushed him down the driveway. “They strapped my flat feet into skis, like these plastic ski boots, and they just sent me down,” said White. Then at age 3, doctors diagnosed him with cerebral palsy, which stemmed from his birth. “It causes deficiencies in muscle structure, so it’s hard to use fine motor skills and gross motor skills like walking, lifting things, supporting yourself,” said White on the condition. During this time, White’s mother, Joanne White, founded the Northern California Children’s Therapy Center, a nonprofit organization, in Woodland, which according to organization’s website, seeks to prevent disabilities through early intervention from pediatric therapists and early childhood educators. White spent his next five years receiving extensive care at the center, slowly gaining strength through exercises like dangling or swimming through a foam pit. He’d also receive custom-made orthotics, along with leg and ankle braces from Shriners Hospital for Children. As the years wore on, White began branching out into sports like soccer, and water polo. Normal cleats were also a problem and didn’t provide enough support for him, so again Shriners Hospital custom made cleats so he could compete. 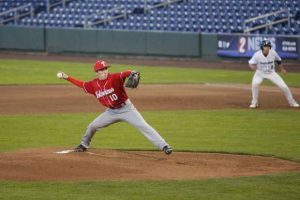 Although he found success in athletics, White struggled with paying attention in the classroom, and was later diagnosed with attention-deficit/hyperactivity disorder (ADHD), Beal’s Syndrome, and Executive Processing Disorder. Through all of the difficulties the youngster forged on. He showed up at the therapy center every day for treatment, becoming stronger and learning how to better use his body. Then as a 7-year-old, White strapped into a snowboard for the first time and discovered a new passion. White would spend the remaining years of his childhood on the mountain riding, drawing comics, playing sports, and dreaming about the pictures he’d been seeing in snowboarding magazines of guys riding in far-off locations. 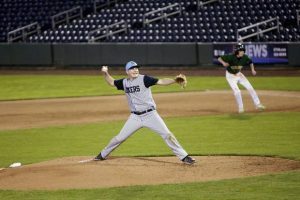 By eighth grade he was strong enough that orthotics and braces were no longer needed, and by the time White had finished high school, he’d set a goal of joining a college lacrosse team. 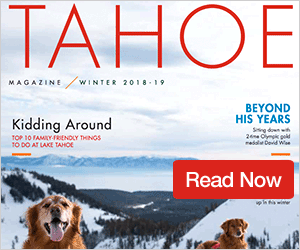 White ended up joining the Tahoe Dogs of the High Sierra Lacrosse League that summer, but during a round-robin tournament at Squaw Valley, those plans were dashed. White enrolled at the University of Nevada, Reno in the fall of 2011, but struggled. He transferred to Sacramento City College in the spring, and by summer had decided to take the following year off. That’s when images of snowboarders atop foreign mountains began creeping back into his mind. In particular, White dreamt of riding in New Zealand, and so when he found a program to become a snowboard instructor in the country, he jumped at it. Part of White’s experiences in New Zealand included a helicopter flight to the top of a mountain where he and a group were dropped off for an unforgettable ride back down. “Growing up, looking at the pictures of all the guys snowboarding down glaciers, I never thought that I would actually be doing it,” said White. Upon his return home, White enrolled back at UNR but continued to struggle. He bounced from major to major, while refusing any assistance offered toward him. Then White fell into the university’s education program. He ended up taking a children’s literature class, and was inspired to head down a completely different path. The next semester White set out to write his own children’s book based around his experiences with characters drawn from himself and his grandfather. He’d also end up with plenty of time to work on it due to a reconstructive surgery on his left ankle. White spent the next months laying in bed working on the story. His hands still remembered the drawing techniques he’d learned as a child creating cartoon characters and comics. Soon his bright orange cast also bore the marks of his early character designs. By the time White had recovered, “Jack and Poppop’s Spectacular Journey,” a tale of inspiration for those facing challenges, was created. Through a little luck, White was able to secure the help of two-time Pulitzer Prize winning journalist Tom Knudson for the story’s final touches. White went on to raise around $5,000 through Kickstarter to have the book published. He then donated a couple dozen copies to the Northern California Children’s Therapy Center for the organization’s upcoming auction. At the auction, White was introduced with a short documentary about his life, and shortly after, a bidding war broke out for his books. “At first it was $100, and then it was $200 and then all of a sudden we’re at $500, and then we’re at $1,000 for a book, then we’re $2,000, then $3,000, then $5,000,” said White. During his time at UNR, White was introduced to Eye to Eye National, a group whose mission is to improve the lives of people with learning disabilities by pairing mentors with young children. Soon after, White established UNR’s own Eye to Eye chapter. The organization helps youngsters with disabilities at a nearby middle school by having college students mentor them. “Working with the kids helped me really acknowledge my own ADHD, my own processing disorder, and also helped me build a community on our campus at UNR,” said White. The chapter has grown to include roughly 15 college members, according to White, and about as many middle school students. Then in 2016, White was offered a chance to speak at the Nevada Transition Conference. The annual conference focuses on the transition process of Nevada’s youth and young adults with disabilities as they make their way out of high school. White continued giving speeches at different events and schools, and the following year was invited back to the Nevada Transition Conference where he spoke to a room of roughly 500 people. “Through my talks I’m just trying to spread awareness about learning differences because one in five people have ADHD or a learning difference, one in 500 people have cerebral palsy,” said White. Before this season White had never competed in snowboarding. In high school, he petitioned the private, all-boys school he attended to create a snowboard team, but said he was told no because there wasn’t a possibility of a girls’ team. So White headed over to the all-girl sister school nearby and petitioned their athletic director to create a girls’ squad. He was again met with dismissal, and so he created a snowboarding club, naming himself president and his best friend vice president. “Honestly we just made snowboard trips to my house (in Truckee),” said White. This season, White decided to join his sister, Catherine Corcoran White, who won nationals last year, in competing in the USASA North Tahoe Series. The two siblings won each of their giant slalom and slalom events during the year and will now compete at the 2018 National Championships on March 30 – April 5 at Copper Mountain Resort in Colorado. The national championships are just another chapter in many for White. 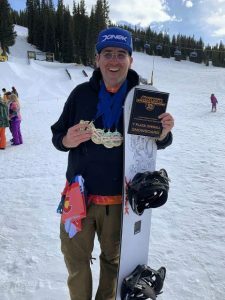 He said he plans on using his snowboarding as a platform to bring awareness to cerebral palsy and ADHD, tying the sport to his speaking career and children’s book. To follow more of White’s journey, visit his webpage at DavesCPLD.com. His book is also available at Etsy.com/shop/jacknpopopshop. “My hope is to inspire all persons whether or not they have a disability or a learning difference to always strive for their greatest potential, to always dream big, big dreams, and to never let obstacles keep them from going after what it is they want during their lifetime,” said White.